Attention buyers! Walisi's Elegant and Exotic Artefacts is proud to announce the auction of the infamous Tragic Hope, a rare statue of unique provenance. Some historians have even linked it to the forbidden Jedi of old! We expect high demand for such a singular piece, so ready your credits for furious bidding! 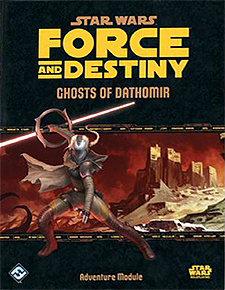 Uncover the past of a mysterious Force relic in Ghosts of Dathomir, an exciting new adventure for the Force and Destiny Roleplaying Game. This ancient item can unlock dangerous powers, and a lethal Force-wielding mercenary is willing to kill anyone in her way to possess it. To stop her, the heroes must defeat Imperial ISB agents, perform daring rescues, fight off creatures corrupted by the dark side of the Force, and unearth a terrible secret buried far beneath a ruined city - a secret that nearly destroyed an entire world! A challenging journey to test the limits of experienced players. Mini-gazetteers for swamp-filled Toydaria and the dread world of Dathomir. New adversaries and vehicles, including a powerful Force user.